Lawrence Makoare plays Lurtz, an Uruk-hai leader in The Fellowship of the Ring, as well as the Witch King and the Orc Gothmog in The Return of the King. Lawrence Makoare was born on March 20, 1968, in Bastion Point, New Zealand where he still lives with his wife and 5 children. Although he is of Ngati Whatua descent he apparently doesn’t speak Maori fluently, which means he has to learn his lines by intensively studying the language (necessary for some of his Maori speaking characters) and in the case of The Merchant of Venice, where he was coached by Waihoroi Shortland, who played Shylock. His first inroads into acting happened when he went with his wife to her drama class, assuming the role of ‘nanny’ to look after their little boy. It was there that he was spotted by Don Selwyn who encouraged him to join in. As a result of his earlier jobs as a road maintenance worker and other similar physical intensive jobs, he built up his phenomenal physique which stood him in good stead as a stuntman where he was able to make a name of himself. His agent suggested he should try acting as well and Lawrence decided to give it a shot. He concedes that his career in acting has mostly been a ‘biceps’ and ‘baleful staring’ curve which spans seven years during which time he has appeared in a Hollywood feature film ‘Rapa Nui’ set on Easter Island, taking the part of a villainous strongman. His other films, mostly in New Zealand, are ‘The Price of Milk’, ‘What Becomes of the Broken Hearted?’, and ‘Feathers of Peace’, which were all produced by He Taonga Films. He had a lead role in ‘Crooked Earth’ playing Temuera Morrison’s brother. With the advent of television programs such as ‘Xena: Warrior Princess’ and ‘Young Hercules’ which were filmed in New Zealand, he had the opportunity to obtain work in them. He has also appeared a few commercials. With regard to Lord of the Rings, he has not actually read the books, not being much of a reader apart from comics. He does say, however, that most of his family have read them and were delighted when he got a part in the films. Originally, his agent had got him an audition for Snaga, who like Lurtz was an Uruk-hai. A few days later, he received a call saying he was successful in obtaining the part of Lurtz. 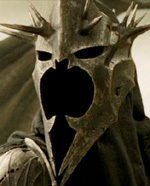 He thoroughly enjoyed his experiences in the Lord of the Rings, even though he had to endure up to 11 hours of make-up. Lawrence was also able to play three separate parts in Return of the King as the Witch-King, Gothmog (a sergeant in the Orc Army) and an ordinary Orc soldier. The highlight of it all was to actually meeting Christopher Lee, because as a child, he had hidden under his brother’s bed when the ‘Dracula’ movies were on. Originally, he had wanted to return the ‘scare’ by rushing up to Christopher Lee in his Lurtz make-up and roaring at him, but was wisely advised against it due to the actor’s senior years. So, he just ended up saying ‘Hello Mr Lee’. Whilst making the Trilogy, Lawrence was picked to play a part in the Bond movie ‘Die Another Day’, as the villain Mr Kil. While away shooting the movie, Sala Baker took over his part of Lurtz in his absence. Appearing in ‘Die Another Day’ puts him in good company with Sean Bean and Christopher Lee as both have appeared in Bond films. For the future, Lawrence is keeping his fingers crossed for few up and coming opportunities; a couple being perhaps Peter Jackson’s ‘King Kong’ and a film adaptation of ‘The Lion, The Witch and The Wardrobe’ being made in New Zealand. When he has time to relax amidst his busy film career, Lawrence enjoys several sports including rugby league, touch football and softball, scuba diving, fishing and swimming.